You really need to pare down your wardrobe as much as possible. When you don't have a closet, you shouldn't be buying extras or any "just in case" items. When organizing your closet, think about organizing a minimalist closet. You may have to DIY some closet storage solutions. And that is OK—DIY closet storage usually works way better than pre-made storage solutions that often don't fit someone's closet or wardrobe. If you're going to store your clothing out in the open, whether because you think it'd look cool, or because you really do not have a closet, you need to commit to keeping your ​DIY closet clean and organized. You can't just toss a sweater in. You need to fold it or hang it up. Finally, get ready for people to comment on your unique closet storage situation. The following are some great examples of how to store clothing when you don't have a closet. A combo of low, free-standing dressers, a hanging rod and a shelf up top on a blank wall will give you the storage you need. Since the dresser is low, it allows for enough hanging space for dresses, slacks, and even long coats. If you install hanging rods on your wall but don't necessarily want to see your clothing all the time, a sleek curtain can hide your clothing storage. But you can't just use any old curtain for this. You've got to pick something you love and that goes with the decor in your room. For example, the drapery options from West Elm, and Overstock.com is another good option for more budget-friendly drapes. Using a clothes rack when you don't have a closet to store your clothing in is a simple, easy way to the create the necessary space to hang blouses, jackets, coats, pants, dresses, skirts and even bags. Tip: don't cheap out. There's nothing worse than being awoken in the middle of the night to your clothes and rack crashing to the floor. People use the spaces under their beds to store books, shoes, towels, and linens. Why not your clothing? Baskets are something you probably already own, and storing clothing within easy reach under your bed is a smart move. Out-of-season clothing, boots, shoes, and accessories are great options when deciding what to store under your bed. 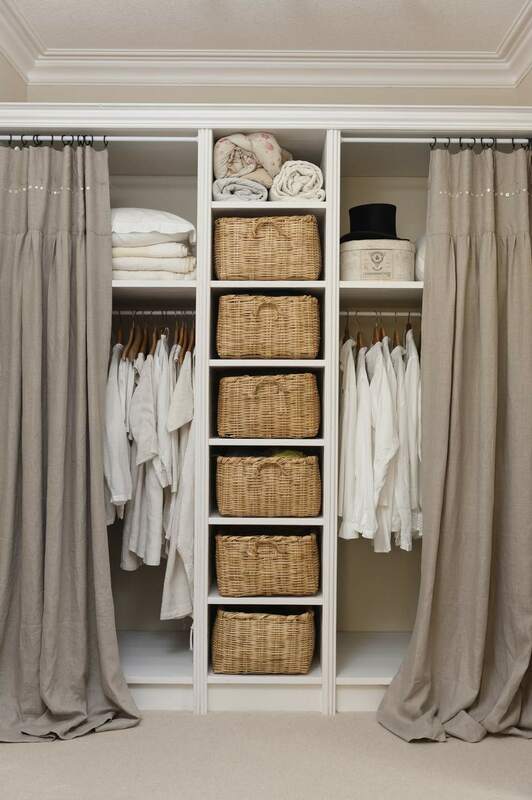 This is a truly creative idea: Install piping at different heights to store clothing of different lengths. For this, you'll need piping, measuring tools and some wall fasteners. If you can't install piping at different heights, then clothing racks at different heights can work. A great way to move clothes out of your moving-around-area and into a better storage-friendly area is to create a clothing nook behind the bed. The space above and slightly behind your bed is space you won't miss in your bedroom. If you have no closet but still need to store clothes in your bedroom, paint your bedroom a stark white. This will cut down on visual clutter and add to a sleek, modern look.